"The members of 7group and Bill Reed are examples writ large of the kind of leadership that is taking this idea of green building and forming it into reality, by helping change minds, building practice, and design process." The integrative design process offers a new path to making better green building decisions and addressing complex issues that threaten living systems. 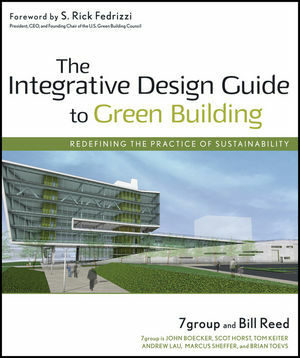 In The Integrative Design Guide to Green Building: Redefining the Practice of Sustainability, 7group's principals and integrative design pioneer Bill Reed introduce design and construction professionals to the concepts of whole building design and whole systems. With integrative thinking that reframes what sustainability means, they provide a how-to guide for architects, designers, engineers, developers, builders, and other professionals on incorporating integrative design into every phase of a project. This book, both practical and thoughtful, will help you deliver your vision of a sustainable environment. 7group, based in Kutztown, Pennsylvania, includes principals John Boecker, Scot Horst, Tom Keiter, Andrew Lau, Marcus Sheffer, and Brian Toevs, who bring a unique integration of expertise in design, engineering, energy and daylight modeling, materials assessments, commissioning, education, and communications to their work. Internationally recognized thought leaders in the green building movement, they have led countless teams through the practical implementation of integrative design on building projects of all types around the world. 7group also has been directly and deeply involved with the development of the LEED® Green Building Rating System, including experience on more than 100 LEED projects. Scot Horst currently serves as chair of the U.S. Green Building Council's LEED Steering Committee. 7group, based in Kutztown, Pennsylvania, includes principals John Boecker, Scot Horst, Tom Keiter, Andrew Lau, Marcus Sheffer, and Brian Toevs, who bring a unique integration of expertise in design, engineering, energy and daylight modeling, materials assessments, commissioning, education, and communications to their work. Internationally recognized thought leaders in the green building movement, they have led countless teams through the practical implementation of integrative design on building projects of all types around the world. 7group also has been directly and deeply involved with the development of the LEED Green Building Rating System, including experience on more than 100 LEED projects. Scot Horst currently serves as chair of the U.S. Green Building Council’s LEED Steering Committee. Bill Reed is an architect and internationally recognized proponent and practitioner of integrative design. He is a principal in three firms: the Integrative Design Collaborative, Regenesis, Inc., and Delving Deeper—organizations working to lift development into full integration with living systems. He served as co-chair of the LEED Technical Committee from its inception in 1994 through 2003, is a member of the LEED Advanced faculty, and one of the first of twelve USGBC trainers of the LEED Rating System. Chapter Two: Building as an Organism. Chapter Four: Aligning Values, Purpose and Process. Chapter Five: The Discovery Phase. Chapter Seven: Design Development and Documentation. Chapter Eight: Construction, Operations, and Feedback. Chapter Nine: Epilogue: Evolving the Field.